Senior quarterback J.T. 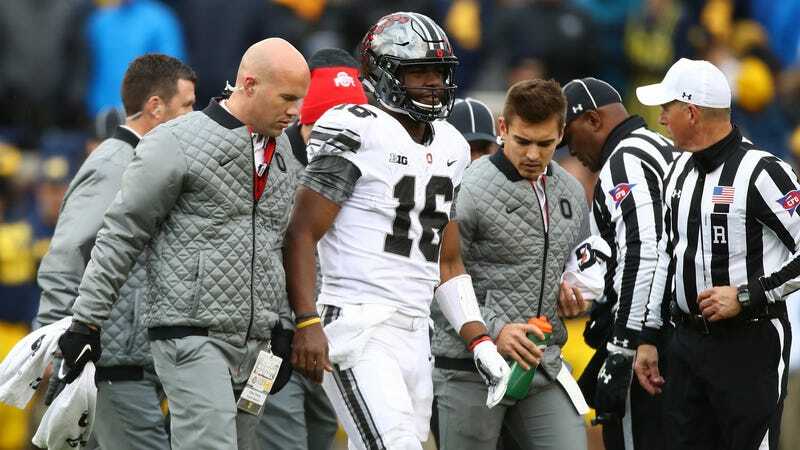 Barrett exited yesterday’s Ohio State win over Michigan with an apparent knee injury in the 3rd quarter, but according to OSU coach Urban Meyer, the blame for that injury doesn’t lie with any Michigan defensive player. Instead, Meyer said an unidentified cameraman knocked Barrett on the knee during pregame warm-ups. Barrett initially played through the injury, but when he aggravated it on a second-half run, he was forced off the field. Meyer said there would be an “all-out investigation” into identifying who on the Michigan Stadium field caused Barrett’s injury. Despite leaving the game with his team down 20-14, and remaining out while backup QB Dwayne Haskins* completed the Buckeye comeback, Barrett became the first-ever Ohio State quarterback to go 4-0 in four starts against Michigan. While his coach was noncommittal, Barrett said after the game that he will play next week in the Big Ten Championship against Wisconsin. *Correction (11:34 a.m. ET): I originally wrote that J.K. Dobbins came in for Barrett, because apparently there is still too much tryptophan in my system. Dobbins is OSU’s starting running back.